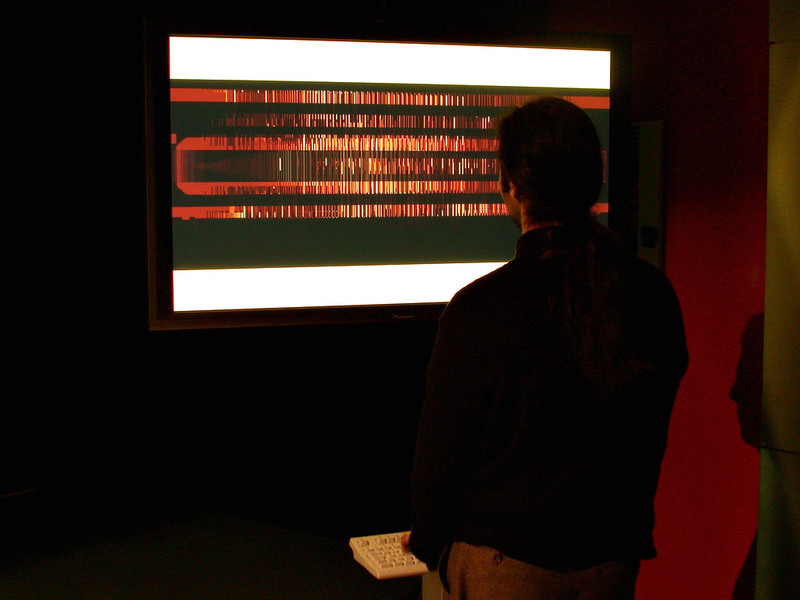 Dakadaka (1999, Casey Reas and Golan Levin) // Typing can be thought of as a percussive spatial action — a play of tiny thoughts scattered onto a tightly organized grid. On the other hand, typing is also a kind of speech, spoken through the fingers with flashing rhythms and continuous gestures. Dakadaka is an interactive software program that explores these two ideas by combining positional typographic systems with an abstract dynamic display. One can understand Dakadaka as a prototype for an ambient display which could augment one's ordinary typing as an auxiliary, transparent layer in an attempt to infuse typography with the fleeting dynamics of speech. 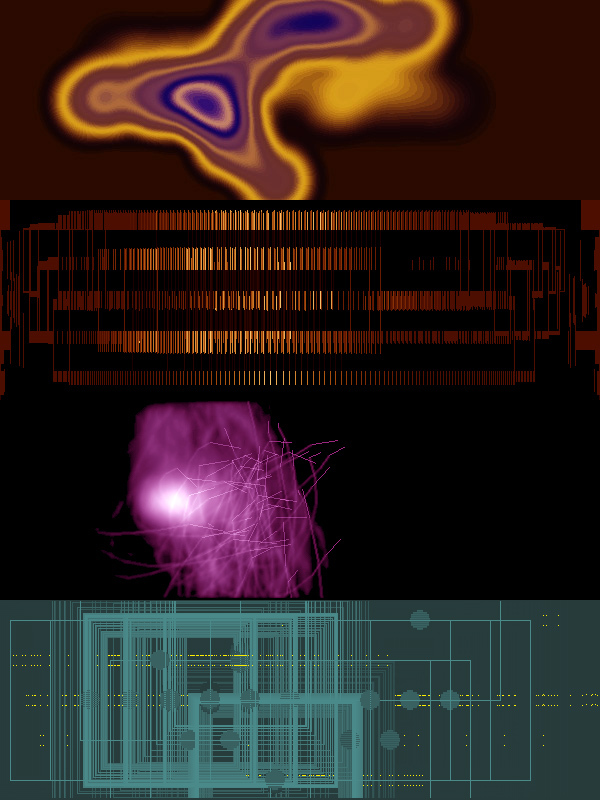 Alternatively, one can also understand Dakadaka as an experience in its own right, re-framing the act of typing at a computer keyboard as a visual exploration. Typing can be thought of as a percussive spatial action — a play of tiny thoughts scattered onto a tightly organized grid. On the other hand, typing is also a kind of speech, spoken through the fingers with flashing rhythms and continuous gestures. Dakadaka is an interactive software program that explores these two ideas by combining positional typographic systems with an abstract dynamic display. Alphabetic and pictographic writing systems commonly create meaning by permuting a large set of dissimilar symbols. There are, however, alternatives that achieve the same result by instead using a set of similar symbols which are differentiated not by their form but by their position in space. Some of these positional typographic systems use permutations of space to create graphemes (letters); others create lexemes (words) by varying the spatial patterns of similar elements. We were inspired by such systems in the design of Dakadaka, because of their natural application to the gridded keyboard space, and because of their ambiguous situation between writing and pure abstraction. By removing the symbolic language (letterforms) from the act of composing words, only the raw physical action of typing remains. The temporal qualities of this physical action are analogous to those of speech itself. But the ordinary written word cannot convey these patterns in time. By connecting the physical act of typing to a dynamic display instead of a static one, Dakadaka reflects these fleeting performances back to us, reminding us of their gestural and continuous qualities. One can understand Dakadaka as a prototype for an ambient display which could augment one's ordinary typing as an auxiliary, transparent layer in an attempt to infuse typography with the fleeting dynamics of speech. Alternatively, one can also understand Dakadaka as an experience in its own right, re-framing the act of typing at a computer keyboard as a visual exploration. Dakadaka was originally commissioned by K10K for Issue #59 of its online exhibition series. 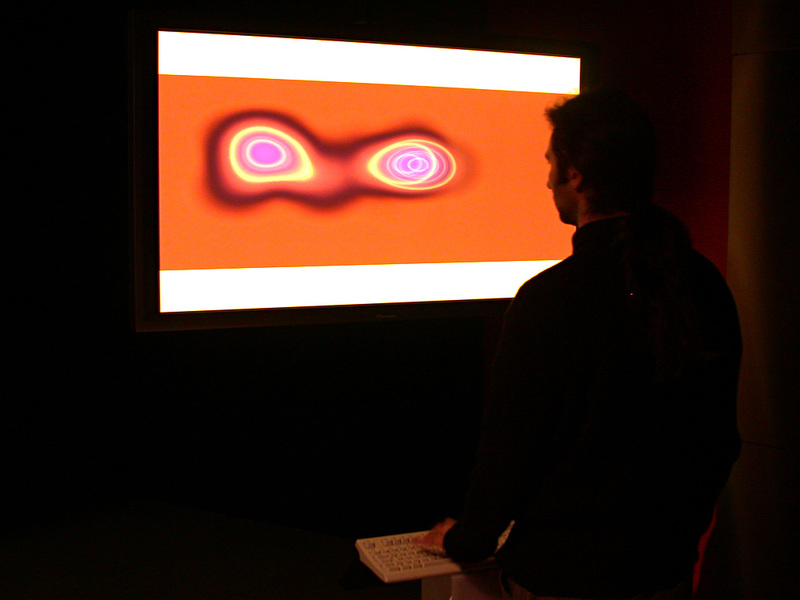 Dakadaka currently exists as a browser-based Java applet, and as an interactive installation which was shown in the "Print on Screen" exhibition at the Ars Electronica Center, Linz, from 2000-2002. The following (silent) YouTube video shows a screen-capture from an interactive typing session with Dakadaka. The same video is also available in Quicktime format at the bottom of this page. Dakadaka can be experienced in this interactive Java applet. Press images of Dakadaka are available from this Flickr photoset.